However, during the last few decades, regular commercial plantations of budded trees have now come up all over India, and fetch quite good price. These India varieties are not as rich in sugar and vitamin C as the good Chinese varieties. However, they contain 50 to 150mg of ascorbic acid (vitamin C) per 100 mg of fruit and 12 to 18.7 per cent sugar. This is even better than the vitamin C content of the juice of sweet oranges. The candied ber also makes an excellent product. These superior varieties of ber are no longer the poor man’s fruit. 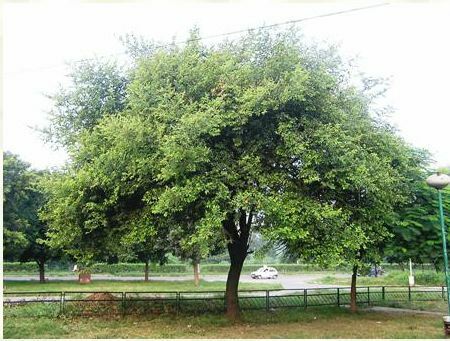 Ber tree is also used in India for rearing the insect Tachardia laccad, which yields lac (or shellac). The industry, however, received a setback after the gramophone industry started using discs of plastic instead of those made of lac. About the botanical identity of the India ber, there has been some confusion in the past. It belongs to the genus Ziziphus of the family, Rhamnaceae, which is very close to the Family of the grape, Vitaceae. Several species grow wild in India. These include Ziziphus oenoplia, Z. rogosa, Z. xylocarnus and Z. rotundifolia. The last one grows as a small shrub in wastelands in Rajasthan and many other States. It also grows as a weed in newly-reclaimed soils. Its fruits are very small and acrid and its leaves are fed to goats and sheep after drying. 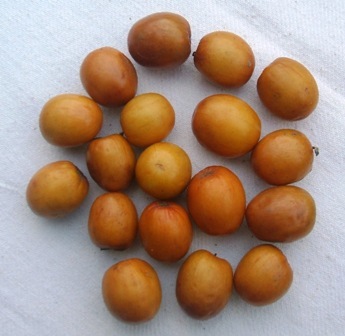 The cultivated Indian ber is very distinct from the Chinese ber, which belongs to the species Z. jujube. 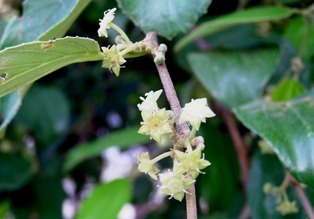 The Indian ber has a spreading tree, vine-like branches, leaves which are dark green on the upper surface and densely felted on the lower surface, it flowers in autumn, bears fruits at the end of winter; if it sheds the leaves it does so in the hot weather after fruiting and does not like a cold climate. These characters are not found in the Chinese species. The India species is Z. mauritiana. The Chinese species is difficult to propagate and is generally propagated by grafting, but the improved varieties of ber in India are easily propagated by ring-budding or by shield-budding in April to June. The root-stocks are generally grown directly in the field, since the ber has a top-root, which is broken or twisted in transplanting. The hard stone around the seed is cracked, treated with concentrated sulphuric acid or stratified in moist sand at ordinary temperature for 60 days before sowing in order to facilitate germination. About 10 days after budding if the buds are green, the root-stock is cut off 10 cm above the bud-union. The buds sprout after three weeks. When the new shoot arising from the bud is 15 cm long, its tip is pinched off to encourage the growth of the laterals for building a proper frame-work of the tree. Trees from which the budwood is to be obtained should be pruned in February or March. Stout new shoot with good budwood are ready after about 60 days. Seedling trees of Z. mauritiana are generally used as root-stock, but seedlings of Z. rotundifolia (Malha, Jharberi or Chanibor) can also be used. Old inferior varieties of ber can also be successfully top worked. The trees are severely headed back in February and a few of the new shoots are budded after about 60 days. The trees are often planted 6 to 7 metres apart, but the distance should be increased to double this length. The ber can grow in almost any soil even under conditions of neglect. Even under these conditions, some of the seedling trees attain a height of over 20 metres. It can also grow in slightly alkaline or water-logged soils. Although ber is a very hardy tree, it does respond to good care. The commercial ber orchardists of India give 20 to 30 kg of farmyard manure to each tree. Irrigation of the young trees during the hot weather, especially of the root-stock before budding, is very desirable. It hastens growth and makes budding easier and surer. No regular tillage is, however, given to plantation of ber. Training of the young trees to give them a strong framework with the main branches well spaced and arising not too high is important. Some annual pruning of the old trees is necessary. It encourages the growth of new shoots to increase bearing. Weak branches are removed. Some authorities recommended pruning every other year. The pruning is done after harvesting the fruit. Another light pruning can be given pruning can be given shortly before flowering. Trees on Z. rotundifolia root-stock are pruned severely and are cut back close of the bud-union. In India, the fruit is harvested from November to March depending upon the region. The yield of the superior varieties varies from 40 to 90 kg per tree. There are many varieties in different parts of India. 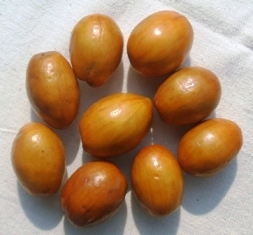 Narma and Karaka are famous varieties of Varanasi in U.P. Umran or Umri is a large-fruited variety with a good yield and a good keeping quality cultivated around Delhi. Gola is very early, round-fruited variety of excellent quality exclusive to Delhi. Unfortunately, it does not have a good transport or keeping quality. Dandan, Kheera and Chonchal are other good varieties of this area. Kotho or Katha are from Alwar, Rajasthan and Meherun ber is from Jalgaon in Maharshta. Mehrun is said to be resistant to fruit flies which otherwise is a serious pest of ber. A seedless variety for ber was found in Poona, but it has not spread, probably due to the small size of the fruits. Birds attack the fruits of ber and are not easy to control. During the fruiting season, the ber trees are covered with fishing, nets in some places to protect them from birds. The biggest menace to ber cultivation all over India, However, is the attack of fruit-flies, Carpomyia vesuviana. It makes the fruit unfit for sale. The flies may ruin upto over 90 percent of fruit. The attack on different varieties may vary form 2 to 100 per cent. The early varieties with large sweet fruits are attacked more. Burying the infested fruits, ploughing the soil under the trees and application of Chlorpyriphos dust (1.5%) followed by spraying 0.1 per cent Chlordane after October every year is able to check the attack. The fruit-borer, Meridarchis scyrode, found in South India can be checked with DDT. 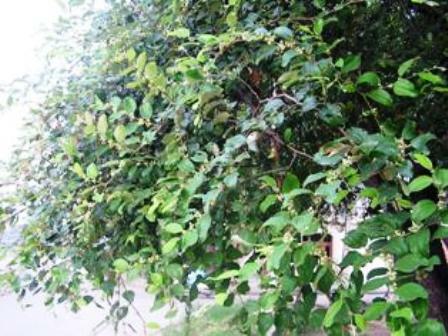 This treatment can also control Porthomologa paraclina, which damages the leaves. Other insect found in India are Thiacidas postica, Tarucus Theophrastus, Myllocerrus transmarinus and Xanthochelus supercilious. The only noteworthy disease of ber in India is the powdery mildew caused by a species of Oidiopsis. It has been reported from western U.P. and can cause shedding of fruits. It can be controlled with lime sulphur wash or 0.1% Karathane spray. Other fungal diseases noticed in India are Mitterellia ziziphina and a species of Cercospora.